You can find part one: here. I say mistakes because I've noticed that while this is a game that is deeply aware of the player's personal decisions there are also clearly choices that do lead to a "game over" screen, either by complete accident or when I simply dabbled with the rules of the game, trying to figure out how clever its boundaries were. Could I pull the child from the frozen lake and then run? The answer is no, I was found and caught; there was no room for half-decision or wily intellect. Some of the finer moments of the game are distinctly black and white despite moments that suggest otherwise. So far I like all the little insights into the character lives -- what makes them tick, the locations in the game seem very linear with the emphasis being on the character driven moments; their decisions and their motives, this along with the rapid fire decision making that you've mentioned allows multiple people to experience Fahrenheit in a number of different ways. So you've picked up on moments and detail that I wouldn't have looked twice at, and the differences are stark and interesting. Fahrenheit does look much better than I thought it would be I must admit -- part of this is because of the upscaling due to playing it on the 360, but regardless it's still a beautiful game; and mostly because the atmosphere produces both dramatic and artistic moments. The colour palettes are distinctive, that almost sepia filter styling the game. It's no high definition action adventure title, but it does have a beautiful charm to both the setting and characterisation choices. I don't need to see the individuals pores in Lucas' skin, his expressions and carefully cultivated emotions show more than the detail could. I've mentioned how much I like the character of Carla, I can't convey enough how much as a female gamer I have to watch women in games simplified to caricature, lying in wait for their hero to wait to rescue them, and if they are blighted by some character problem which makes them unable to function without a leading man. Strong leading or supporting women are rare, and as such the majority of female characters are extremely difficult to relate to. I particularly liked her character driven moments, her playful fight with Tyler to help her unwind and her strong sense of camaraderie even while she's in the ring with him, those playful pats and smiles shared between them were lovely. So the moments I spent trying to navigate her through the police archives were very frustrating for me as a player, but an inspired choice for character development -- her phobia was a perfect way to bookmark how ordinary she is, full of fear and indecision just like everyone else. I think I'd have disagreements with Quantic Dream about if that was the best way to approach it, having to juggle controlling her fear through breathing in a time consuming QTE which provoked my first major frustration in the game. I fear I am not growing as attached to Tyler as I should be. Out of everyone in the cast he's an extremely pragmatic sort of guy -- but to me it also feels he's the main comic interest to the story. That may just be down to chance, his appearances coincide with the funnier moments of the game: such as the book owner putting on a fake Chinese accent, a late rush to work, and two very tongue in cheek instances of breaking the fourth wall. You mentioned Tiffany, but Sam -- Tyler's partner -- made more of an impression on me, she was a very real face on the risks involved in the fly away stories that games often create. Sam reminded me that we're only ever a few steps away from tragedy (or worry about someone) and games don't always manage to convey that sense of loss when the worst happens at all effectively. It was a bittersweet moment that deserved a pause for thought. Some of the weirder influences of the game are starting to creep through now -- I'm no longer entirely sure what the darker influences controlling Lucas are, who he's being controlled by, and just who all these shadowy creatures drawn to him actually are; his conscience? Something fallible? I can only speculate. But what is clear is that the nostalgia scene of his past makes it unclear just how long he's been marked by this shadow. I imagine that scene was included to help place further doubt on Lucas' recollection of events. That said I didn't completely enjoy the retrospective part with Marcus and Lucas as children, I felt it was a distinct change of pace from the rest of the game, but Fahrenheit has the right balance of adventure, intrigue and annoyances. It's well paced, throwing in another curveball as soon as the drama is starting to tail off. The introduction of Agatha was a particularly interesting moment, exploring the darker themes of the game that the opening scene explored, through that kooky house, slanted camera angles and rooms full of birds. And I must say I think this is a game exploring the ideas of innocence and experience, how even the most intellectual and open-minded people (such as the four main leads) understand very little about the true boundaries of the world they find themselves in. Revisiting the murder scene with the gaps in Lucas' memory return was a moment of intrigue - a fabulous plot device - just a shame that it had to be endlessly punctuated by QTEs, although I get on with Fahrenheit's usage of QTEs quite well they distract from the cinematic moments a great deal and are used a little too often. I imagine Agatha has a particularly interesting backstory that I hope is developed more, as I no longer fully understand what is going on spiritually with the game anymore; I am still on tenterhooks. Well, without trying to spoil anything that will come up in the future, you and I are both probably in the area of the game where things start to change up and head towards that confusion you appear to be already going through. When most people speak about Fahrenheit they praise it, but also always mention the third act's abrupt change of pace, and how it impacts on the overall experience. Back when I originally played the game, it didn't bother me too much because the overall experience was so unlike anything else I had previously played, but I could always understand their concerns. But this is something that will no doubt be discussed later, so I'll save any further thoughts for then. There's no denying that Fahrenheit explores some really interesting themes and subjects, and I think some of the scenes you have mentioned are prime examples of this. We have insight into Lucas' past, which elaborates not only on him and his relationship with his brother Marcus, but also the weird and vague mental issues Lucas appears to have. As far as Carla is concerned, we see that she's a normal person who sometimes needs to do something to unwind every once and a while, to clear her mind and distract her from what she has been focusing so hard on -- namely the murder. We also learn of her Claustrophobia, and the inclusion of such a normal fear in a videogame is a remarkable point when compared to other games in the industry. Claustrophobia is a natural fear that countless people go through, and they each deal with it in different ways. Unfortunately for us, as the players, we have to deal with it by pressing the left and right triggers in tandem to simulate (awkwardly) the act of breathing. Do it too fast and we fail; don't do it enough and Carla gets scared and has to run out of the archive. Balancing the moment whilst also trying to find the Kirsten file is, frankly, quite tedious, and it's too easy to focus on one action while forgetting to do the other. However, the scene is admirable in its attempt to not only feature a commonly-found fear in a videogame, but for also having the guts to try and make it related to gameplay. That's the thing that stands out to me the most about Fahrenheit overall: what it attempts to do may or may not be successful, but exploring more realistic themes within a narrative is a step in the right direction for the maturity and continued growth of the videogame medium, and the very fact that Quantic Dream tried these things says a lot for their ambition as a developer, their passion for the medium and their desire for it to progress. I share these qualities, which is why I was so excited to see what Heavy Rain may deliver, but that's a topic for another day. The last thing I wanted to mention today is my disdain towards the Quick-Time Events. Out of all of the games out there, I would suggest that Fahrenheit utilises QTEs in the most interesting and exemplary sense, but when I think about that further I realise that it depends on the context. When performing the more mundane tasks in the game -- such as getting a drink, checking email on a computer or playing the guitar -- the corresponding buttons make sense and aren't a chore. 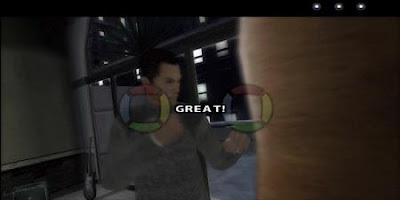 The gentle pushes of the right control stick required to perform a task are controls that flow well within the context of the game and thus, feel natural to do on the controller. But whenever the two coloured circles -- both of which have four directional movements that light up whenever we need to press each control stick in that direction -- appear, that's when things become awkward and arbitrary. It shouldn't be difficult to punch a punching bag or shoot hoops in a one-on-one game of Basketball, but it is because of the quick reaction times needed to push both control sticks in the directions displayed on screen. We only have seconds to react, and it's very easy -- because both circles look exactly the same -- to get confused and press the wrong one. This problem is exacerbated in the more intense action sequences, where our ability to hit these commands as required defines our success in them. It is very easy to fail and get game over because you didn't react to these convoluted sequences quick enough, or because you made mistakes under the heat of the moment. Which brings me to another flaw that I think Fahrenheit has: it's far too easy to fail and have to redo scenes again. For example, the scene in Lucas' apartment where you need to clean up after the murder and before too long a cop comes to investigate some screams reported by the neighbours; here you have a whole bunch of menial tasks you can do, either to clean up or to relax Lucas who is distressed over his recent actions. The order in which you go about these tasks, or even whether you do them at all, is mostly irrelevant; but if you're not observant and completely aware of the evidence you need to deal with, then it's too easy to get busted (game over) by the incoming cop, meaning you'll have to start again. This is also possible in the opening murder scene -- whereby if you're not quick enough to get out of there, or don't do certain things like pay your restaurant bill, you will fail -- and a few other scenes. For a game that emphasises the human factor in terms of both character development and the actions that are available, the ease with which failing is possible seems at odds with the overall intended experience. But really, despite the frustrations that these flaws derive, it's very easy to forgive and forget as the game's positives completely outweigh its negatives. What about you? Are there any particular flaws (aside from the QTEs you've already mentioned) that you are finding particularly cumbersome?